Sales of premium midsized SUVs are up 6% or more than 12.000 units on the first three quarters of 2013, thanks to the introduction of two all-new models from Porsche and BMW. The Audi Q5 holds on to the first place it claimed in the second quarter, but the recently refreshed Volvo XC60 continues to stay close, even outselling its German rival in September. I don’t think the XC60 will be able to pull a rabbit out of its had and finish in the segment’s first place for the first time ever, but reclaiming the second place it already held in 2009 and 2010 would be almost just as impressive considering the increased competition since. The Range Rover Evoque led the segment in the first quarter of the year, but has fallen behind since, being outsold by the recently updated BMW X3 in the second and third quarter, although it remains firmly in third place. 2014 is going to be the third year in a row where the Evoque finishes on the third step of the podium of the premium compact SUV segment. 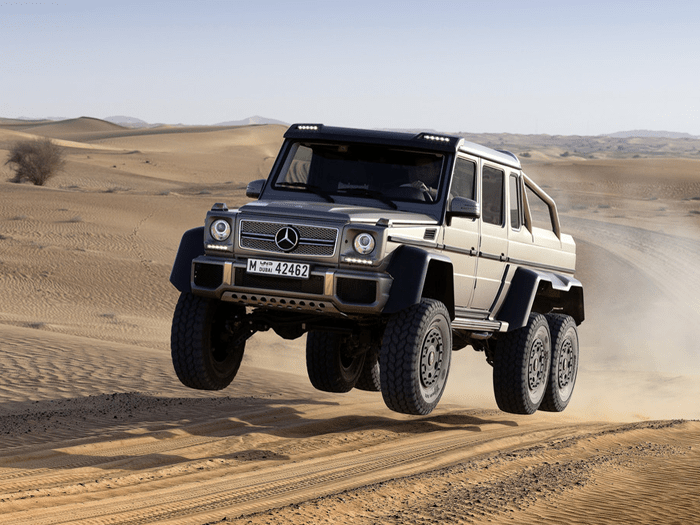 The Mercedes-Benz G63 AMG 6×6 is an automotive extravagance, absurdity on 6 wheels. Or, as Mercedes call it themselves: the automotive declaration of independence. Other people would call it an unnecessary waste of (natural) resources, but as Top Gear have shown in their review, there are some very important things you can do with the 6×6. For example: jumping sand dunes, climbing rocks and driving through a swimming pool full of people, which are of course very sensible things to do. More is always better when it comes to power, and the G63 AMG 6×6 proves that for certain on-road, but mostly off-road activities, the same goes for the number of wheels. But what if you come up short on the € 380.000,- / US$ 525,000 / £ 315,000 excluding taxes Mercedes is asking for this six-wheeled monster? The premium midsized SUV segment in Europe remains stable in 2013, also in the models ranking. BMW X3 shows the biggest decline, but remains the leader of the segment, although Audi Q5 is getting close, followed closely by the highly successful Range Rover Evoque. Volvo XC60 loses some ground, but is still way ahead of Mercedes-Benz GLK. Mercedes clearly have made a misjudgment giving it a square, rugged look compared to the sleek, rounded exteriors of X3 and especially Q5, as GLK is selling at half the volume of its German competitors.